The Artist: John Sedlar. Too Beautiful to Eat. Food as Art. Playa & Rivera Restaurants in Conjuction with Pacific Standard Time. Los Angeles, CA. What is the saying? Actors want to be singers. Comedians want to be actors. Politicians want to be anything that'll get the votes. What about chefs? Is the chef's true ambition to become an artist? If you consider the beautiful plating of food from as far back as the days of the Imperial feasts in China with intricate designs of peacocks carved into fruits and vegetables to today's molecular gastronomy where just about anything is possible, the idea of chef as artist is nothing odd. Chef John Sedlar, the man behind Playa and Rivera and whose lifelong mission is to educate Americans about Latin Cuisine, has joined forces with the über-ambitious Pacific Standard Time collaboration of art exhibits with the participation of more than sixty cultural institutions across Southern California. Smartly (and artly? ), the organizers of Pacific Standard Time have worked LA's food culture into its programs. From now until the end of March 2012, you can stroll into Chef Sedlar's restaurants Playa or Rivera, present your Pacific Standard Time ticket stub and ask for the "secret menu" designed specifically for the exhibition. The dishes and cocktails have all been inspired by various works of art in the show. It's art that's edible — the best kind if you ask me. There's a lot of mezcal under the hood of these Chevies! Beverages are also included in this art meets food "secret menu". 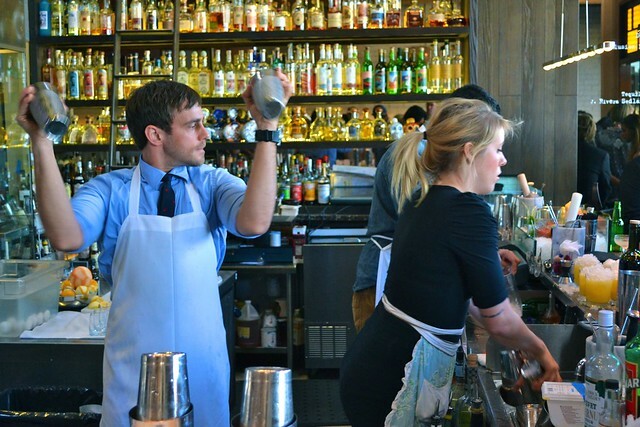 Mix Master Julian Cox concocted cocktails based on an Oscar Castillo piece called 47 Chevy in Wilmington, California. The photograph of the classic, bright yellow Chevy is interpreted cheekily and tastily as an alcoholic bevvy in all its primary color glory. 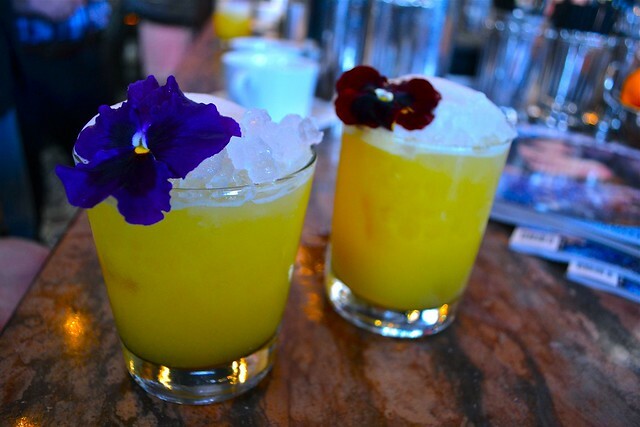 The drink's floral flavors hummed like a finely tuned engine with tartness from the fresh lemon and passion fruit, sweetness from the agave nectar and smoky mezcal. Keep your eyes on the Ball Drop! The "Ball Drop" cocktail is based on Ron Cooper's 1969 video art piece of the same name where a metal ball comes crashing through glass, shattering it in a beautiful burst of violence. 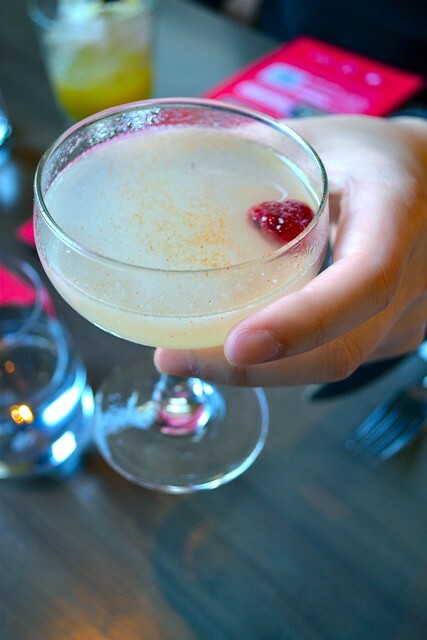 The Ball Drop drink is not so splintered but, rather, harmonizes all of its components of Single Village Mezcal, London Dry Gin, fresh lime, yuzu tincture, velvet falernum and cayenne. Sweet, tart, smoky, nicey! Julian Cox's crew never stopped the party train. Drinks were flowing like Eminem rhymes live on stage. What's this drink called again? Larry Bell's 1964 sculpture Untitled was ironically the title of a stodgy drink comprised of Chichicapa, Cocchi Vermouth di Torino, oloroso, grapefruit peel. 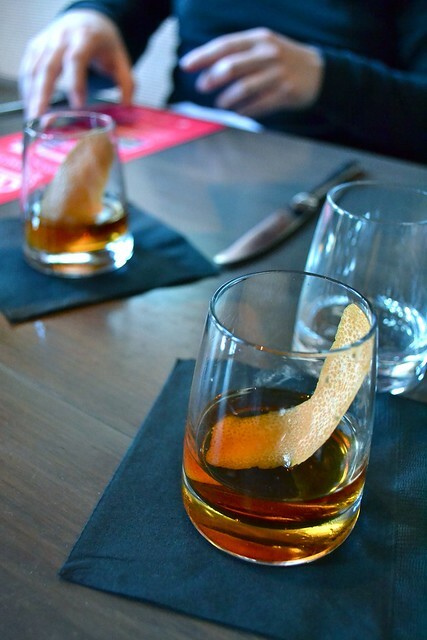 Yet another citrusy, smoky number that sated the palate and soul. 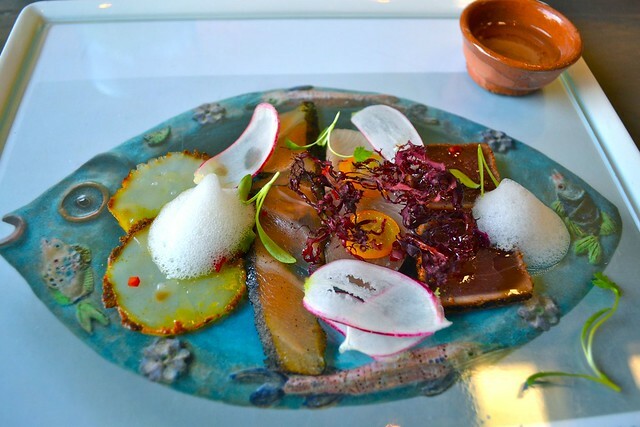 The starter plate of a crudo assortment was presented on a plastic white platter with the art piece called Fish Platter printed onto it. If one had overindulged in Julian Cox's elixirs, it would be difficult to tell where the food began and the art ended and vice versa. The print of the aqua marine ceramic platter of a fish created by Beatrice Wood circa 1970 seemed to perfectly cradle its delicious contents. Wafer-thin scallops tasted of spicy curry. The smoked salmon was delicate yet commanding. The fantastically fresh yellowtail may have been just plucked from the waters. The ahi tuna zapped with some heat. Punctuating everything were the lively lime foam and the crispy dried seaweed. The roof! The roof! The roof is on fire!! 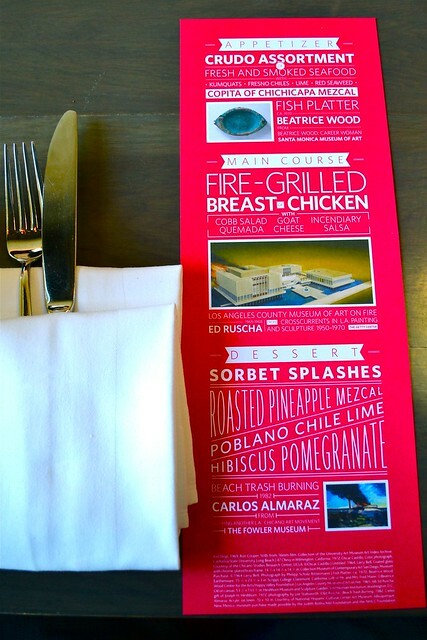 With its muse as a burning building, the "Fire-Grilled Breast of Chicken" was presented on a plate also with the artwork of the inspiration piece imprinted. This time it was the Ed Ruscha piece Los Angeles County Museum of Art On Fire. 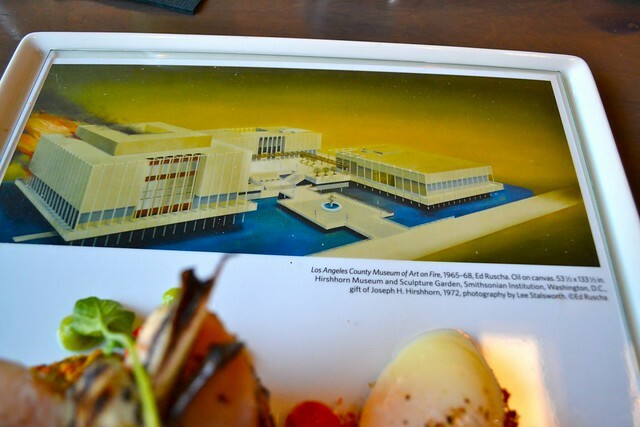 I tried really hard to make the connection between the blazing museum and the dish but gave up pretty quickly and just ate the flavorful roll of tender chicken breast atop of "incendiary salsa". 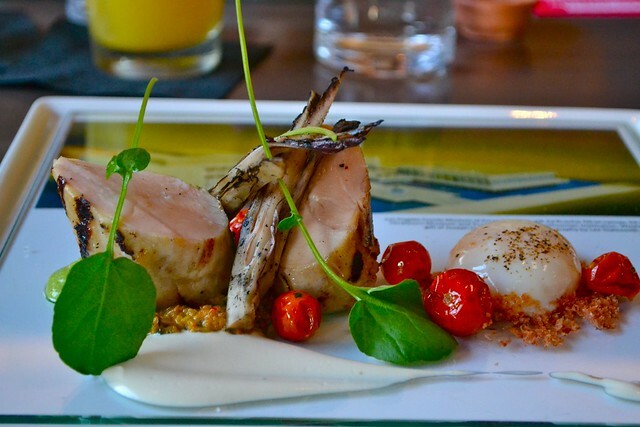 A bubble of delightfully poached egg completed the fowl's circle of life as well as the delectable entree. Another pyro-piece was the launching point for the dessert portion of the meal. 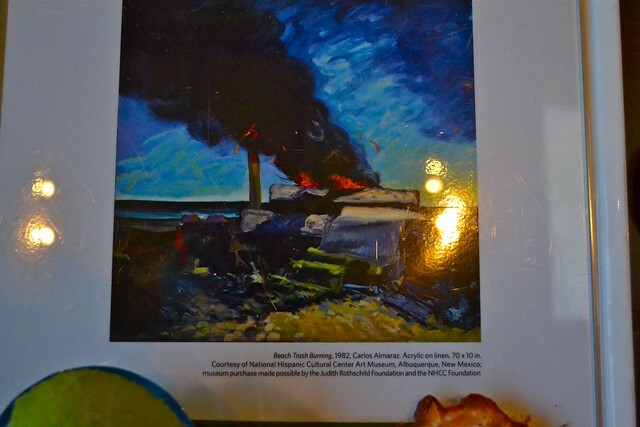 Beach Trash Burning, a 1982 painting by Carlos Almaraz, somehow motivated Chef Sedlar to create a trio of sorbets that you might order at a gelato stand. The green, yellow and red sorbets were pretty art pieces on their own. A Roasted Pineapple Mezcal sorbet was refreshing. Contrasting that was the Poblano Chile Lime sorbet which packed the heat. 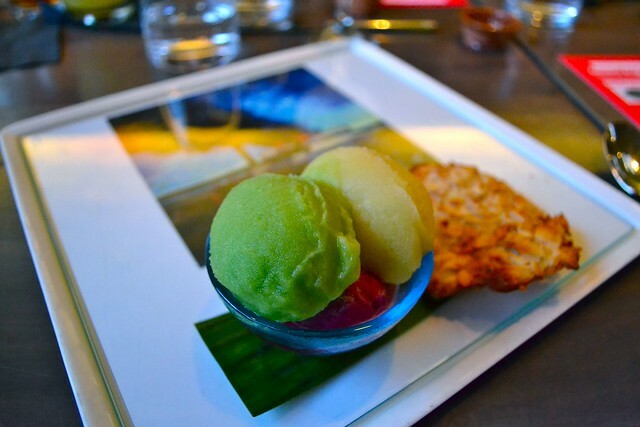 A soft Hibiscus Pomegranate sorbet gave a pleasant and gentle ending to this arty-foodie secret menu. 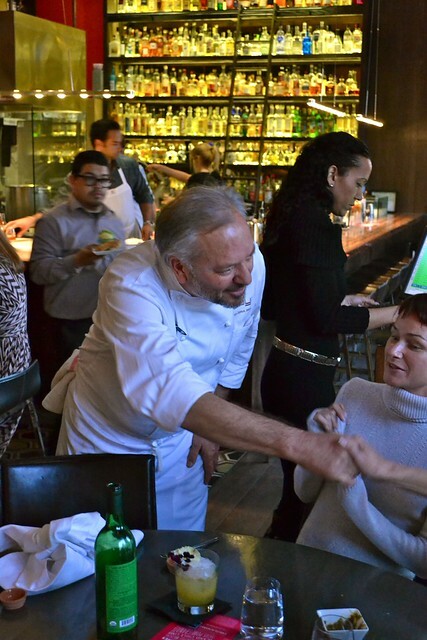 And like any adored artist at the end of a show, Chef John Sedlar greeted his admirers, each one of them taking home a piece of his work — in their bellies. Mention you visited any of the PST art installations, and you will be presented with THE SECRET MENU, a unique opportunity to experience dishes inspired by PST. THE SECRET MENU will be presented only to those guests who know to ask for this special menu. Select single-village mezcal cocktails from Del Maguey will also be offered. The Secret Menu will be available from February 7th until March 31st. Hi dear. The picture on the food looks delicious.